Singapore is popular for many historical places, architectures, and attractions, besides its usual identity as the hub of trade in Asia. If you are planning to visit Singapore as a tourist, you must include Helix Bridge in your itinerary. 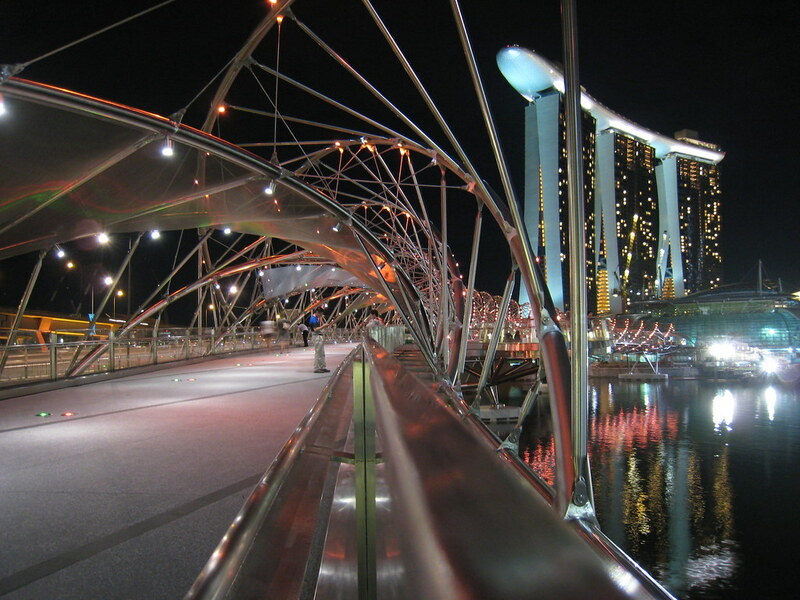 Once known as the Double Helix Bridge, the Helix Bridge is a favorite among the pedestrians. 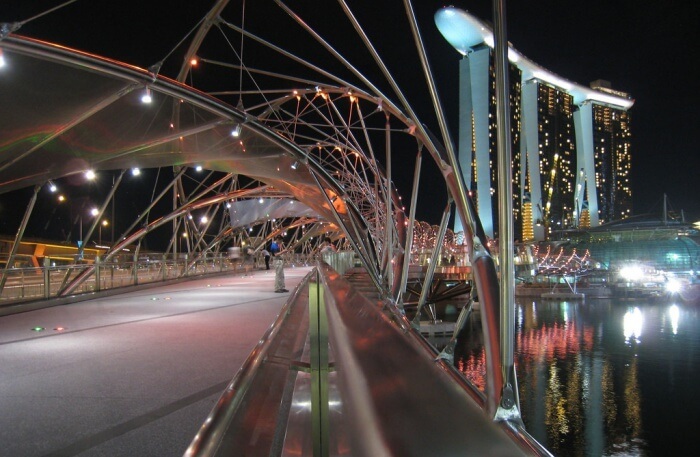 It is the world’s first double helix bridge. This bridge connects the Marina Centre with the Marina South in the Marina Bay area. Being a remarkable piece of unique architecture, it receives visitors from across the globe. One of the major landmarks of Singapore, this internationally popular bridge is 280-metres long. 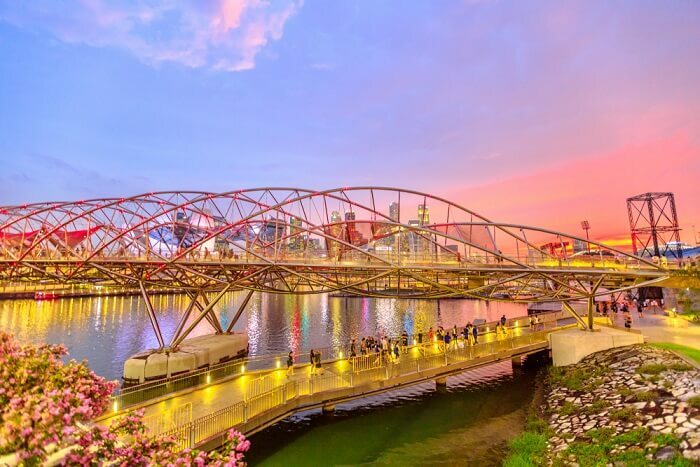 From the bridge itself, people can enjoy assessing the scenic beauty of Singapore’s skyline and various events in and around this place. A series of dynamic multi-colored LED lights glow in the evening that makes this bridge look spectacular with its gleaming presence. 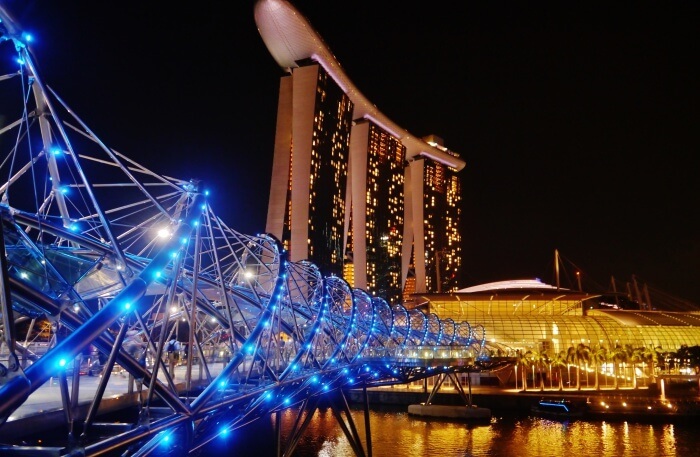 To capture the panoramic and breath-taking views of the Marina Bay, this bridge remains a perfect spot. 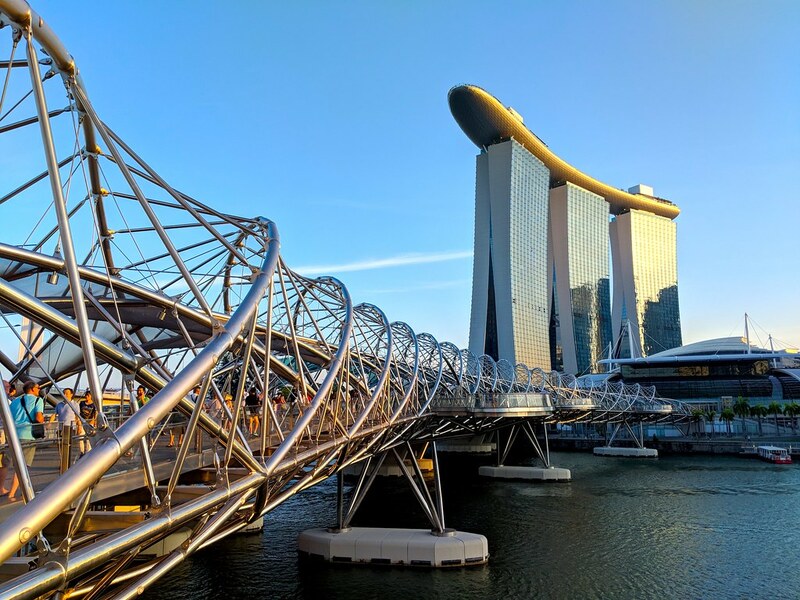 The Helix Bridge was designed and constructed under the supervision of the internationally renowned and national architects and engineers support team. Whether it is daytime and or at the night, visitors keep flocking here to enjoy the best moments of their life here. For the photo sessions though, there are special arrangements in this place. 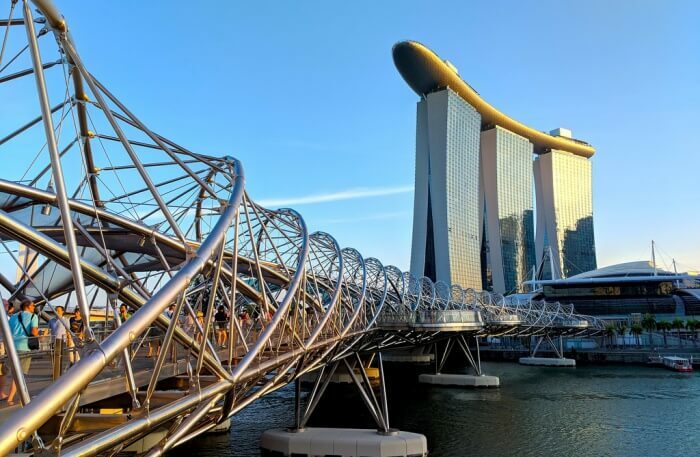 The incredible beauty and unbelievable design of Helix Bridge makes it a must-see attraction in Singapore for the visitors of all categories. 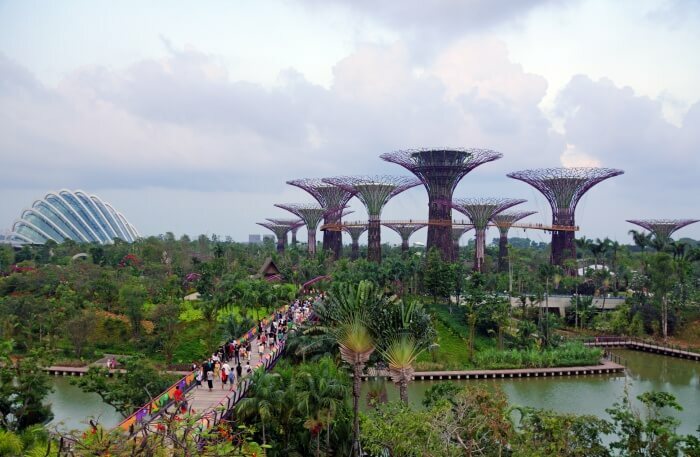 One of the popular tourist attractions near the Helix Bridge is Gardens by the Bay. Spanning over an area of 101 hectares of reclaimed land, the garden is a nature park. Situated adjacent to the Marina Reservoir, this garden comprises of three waterfront gardens that are Bay South Garden, Bay East Garden, and Bay Central Garden. 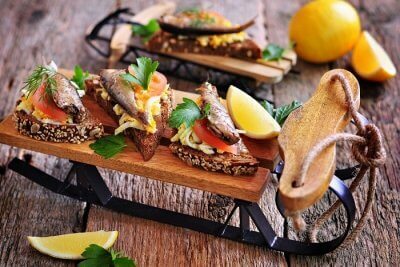 Enjoy the scenic beauty and also eat the local food here. 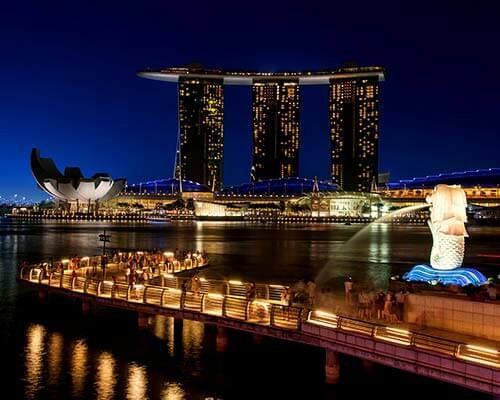 Must Read: 15 Singapore Travel Tips You Must Follow For A Value For Money Experience! 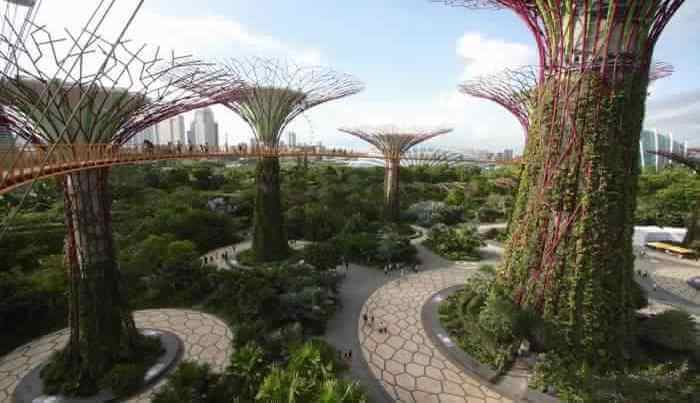 Located in Gardens by the Bay, Supertree Grove is an exclusive vertical garden with towering trees and large canopies. They bloom amidst an exciting display of lights and sounds at night. Measuring it to be probably between 25 and 50 meters tall, the Supertree Grove is designed to enthrall the visitors. 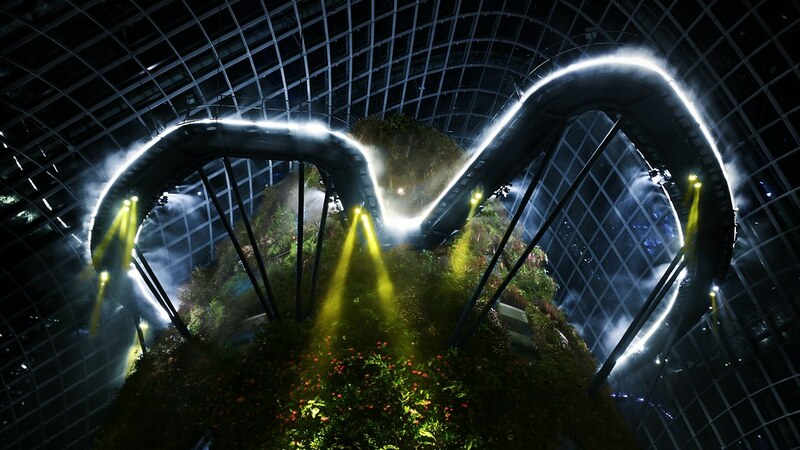 Cloud Forest, a mysterious world veiled in the mist, is a tropical highland in Singapore. It has a tall waterfall in the soaring as well as an exceptionally contemporary greenhouse. Visitors can learn about rare flora and fauna here. They can also enjoy the fast-disappearing environment of clouds. 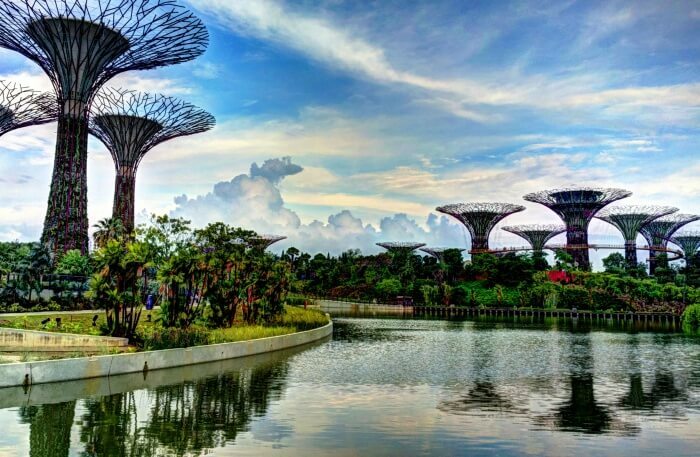 It is a perfect place to encounter the incredible scenic beauty in Singapore. Plan your trip with your family or colleagues if you want to enjoy your trip to the fullest. 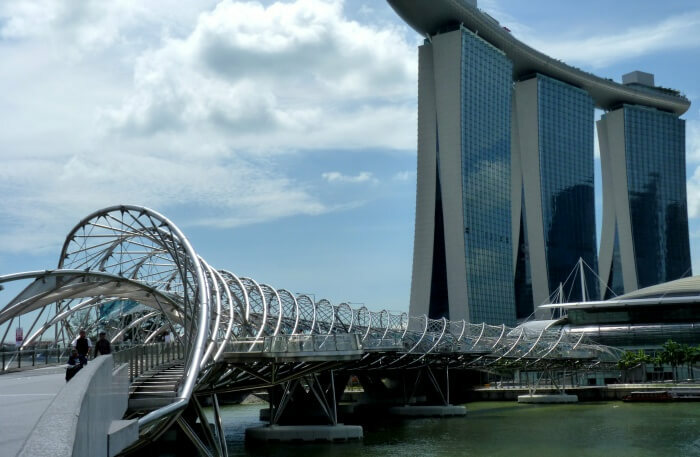 Visiting OCBC Skyway should be one of the things to do on your itinerary while exploring the Helix Bridge in Singapore. What's more, OCBC Skyway connects the two Supertree Grove Towers. 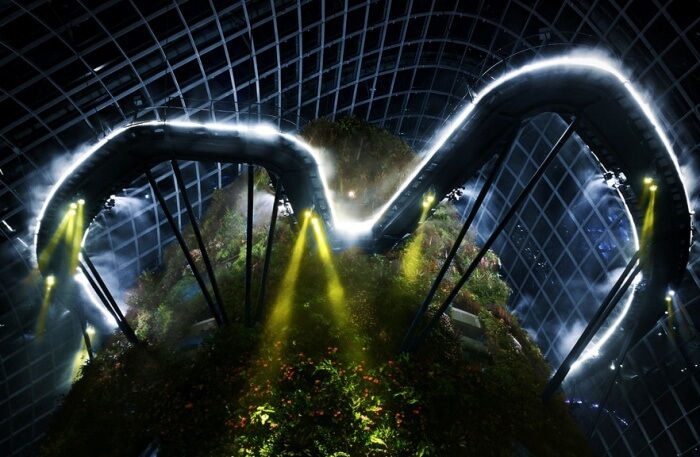 This 128-meter long aerial walkway offers the visitors a great photo-taking opportunity while exploring the panoramic view of the surrounding flora. 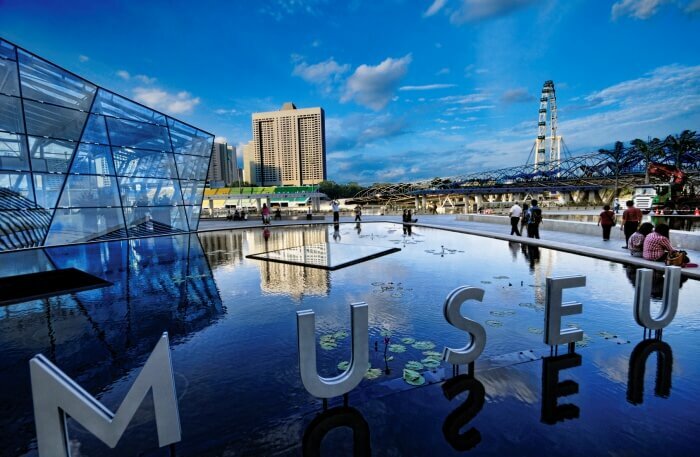 ArtSpace Museum, which is located at the Prestige Istana Park, redefines art and lifestyles. Being a leading art club for all, anyone from anywhere can learn, enjoy and appreciate art here. It can be reached easily as it is just a 5-minutes walk away from the Dhoby Ghaut MRT. It offers flexible timing and personalized painting and drawing workshops for the art lovers to explore, learn from and enjoy. 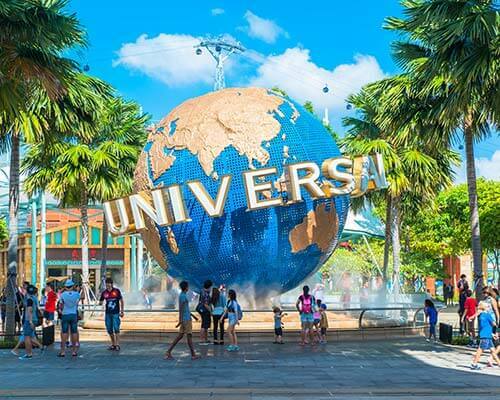 Suggested Read: Top 5 Water Parks In Singapore That Let You Beat The Heat In The Lion City, In Style! If you want to see Singapore from above, then you don’t have a better option than getting into the Marina Bay Sands SkyPark. This attraction is situated in the middle of the town. 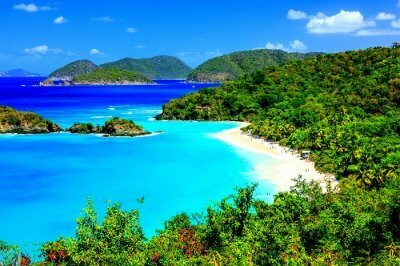 It offers you a 360-degree panoramic view. If you are planning to visit this attraction, make sure you book your tickets well in advance to save yourself from the last-minute hurdles. 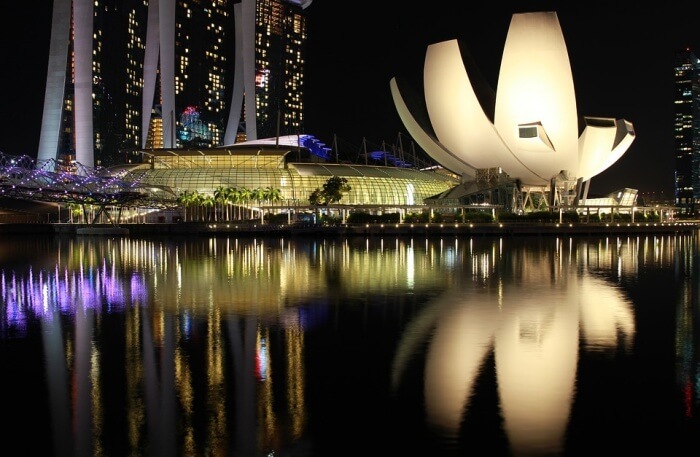 While exploring the attractions in and around the Helix Bridge in Singapore, you should keep the Marina Barrage in your itinerary. Built at the confluence of the five rivers, the barrage provides water storage, flood control, and recreation activities to all. 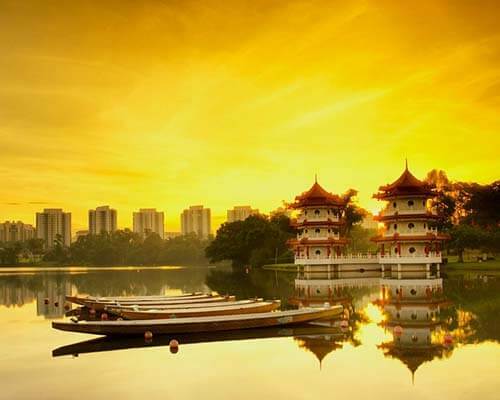 This Singapore's fifteenth reservoir is the vision of the late Mr. Lee Kuan Yew, the first Prime Minister of Singapore. 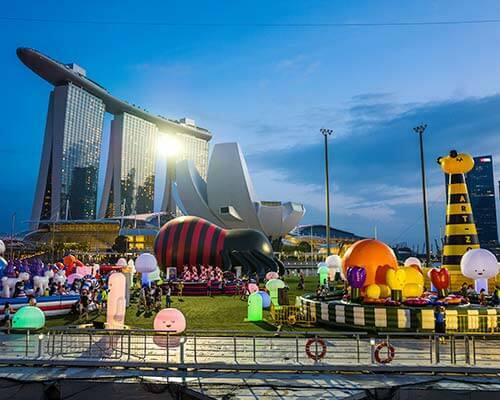 Once a quiet body of water, the Marina Bay has undergone a big transformation and has become a most luxurious travel destination of the country. Besides that, this bay is also home to some of Singapore’s most iconic hotels, skyscrapers, restaurants and other attractions. 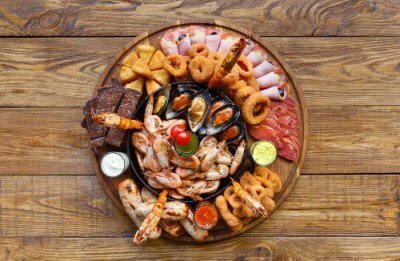 You can also find hotels and restaurants to eat and visit the shopping malls nearby. This area is also popular among the disco lovers for great nightlife activities. 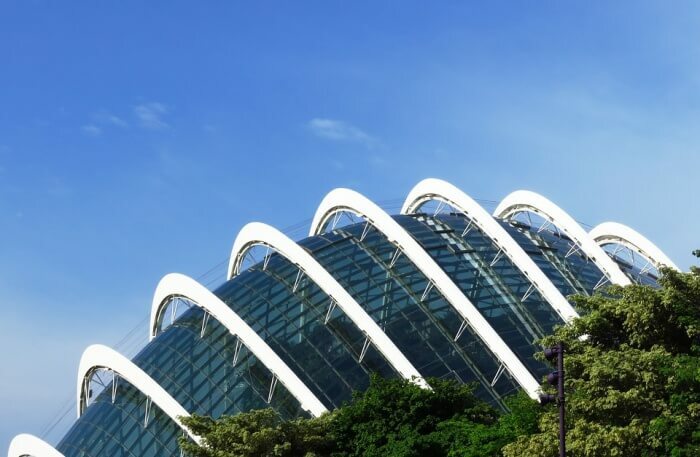 Flower Dome is a gigantic air-conditioned glass greenhouse in the Helix Bridge, Singapore. 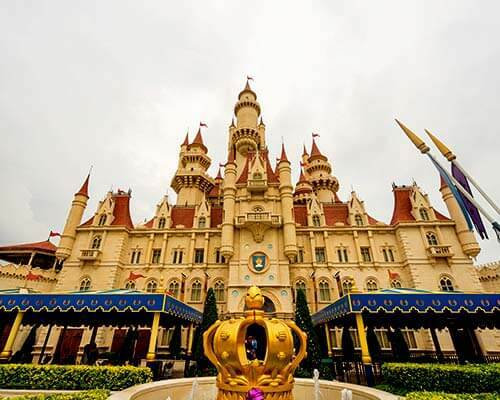 It has the themed gardens with many exotic plants to literally keep you hooked. 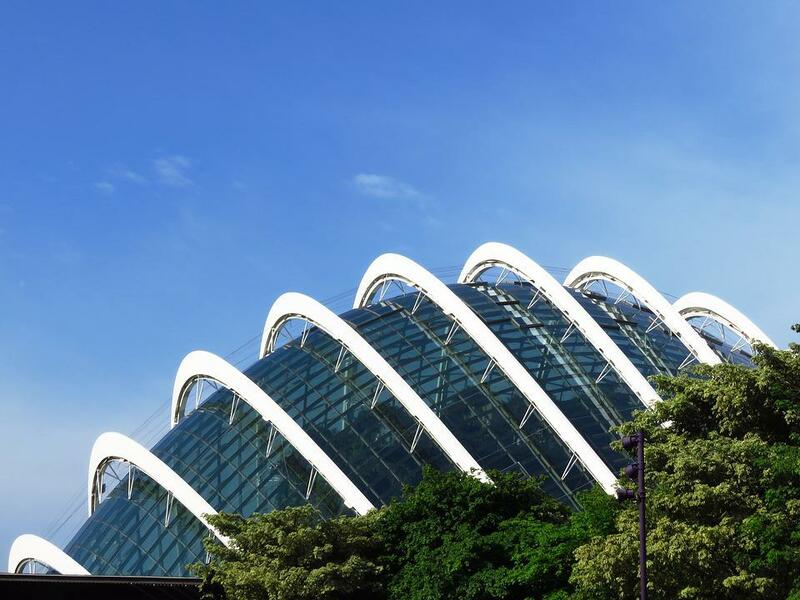 If you love rare flora and fauna, you should consider the Flower Dome in Singapore. The visitors often get surprised by the changing display of different types of flowers, plants, and trees in the Mediterranean and semi-arid regions. 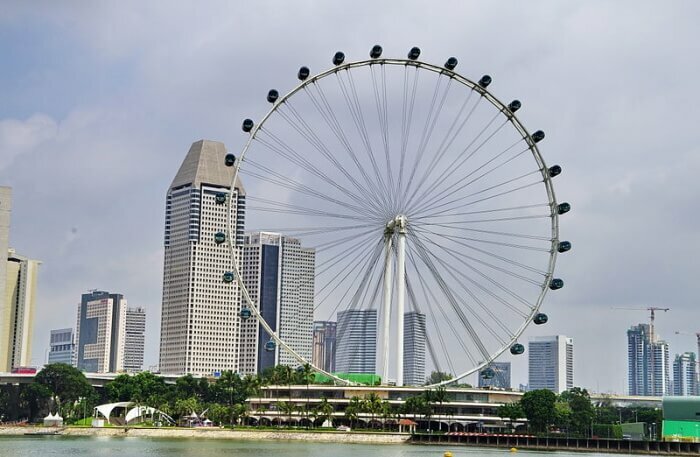 If you want to watch a giant Ferris wheel in Singapore, Singapore Flyer could be the perfect gateway for you. Opened in 2008, it took about 2.5 years to get the construction work done here. This Flyer is one of the world’s largest Giant Observation Wheels which attracts a countless number of people from across the universe. The flyer is also one of Asia’s biggest tourist attractions. The Helix Bridge is a pedestrian bridge in Singapore. It had been officially opened on April 24, 2010. Linking Marina Centre with Marina South in the Marina Bay, this bridge captures the untouched beauty of Singapore beautifully. You can reach the Helix Bridge by bus, car or train. From the bus stop, the destination is 4-minutes walking distance. The nearest railway station is the Promenade MRT station. It is a seven-minute walk to the bridge. Your trip to Singapore will remain incomplete if you don’t explore the Helix Bridge and its nearby attractions. There are several things to do in the Helix Bridge and the places nearby it. 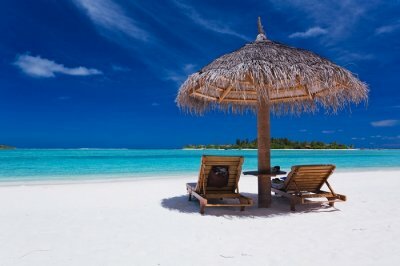 You should choose your trip by keeping in mind our suggestions and travel advices. We promise that you won’t be disappointed.